She was the matriarch of a highly regarded West Adair County, KY, family. Mrs. Dickson was a member of the Prices Creek Missionary Baptist Church, and was a homemaker. She was born at Weed, Adair County, KY, and was a long time resident of the Prices Creek Community, Adair County, KY, at the time of her death. She was the daughter of the late Andrew and Carrie Compton Moore. Her husband of 68 years, Fred Dickson, survives. She leaves 14 direct living descendants. 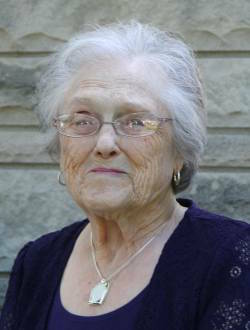 Myrtle Dickson, 89 of the Prices Creek Community of Adair County passed away Sunday, September 20, 2015 at 11:14pmCT, at her home after several months illness. The funeral service will be Wednesday, September 23, 2015 at 2pmCT, at the Prices Creek Missionary Baptist Church, 1636 Prices Creek Road, Adair Co., KY, with Bro. Gary Watkins and Bro. Danny Wayne Sexton the officiating clergy. Interment in the Shirley-Dickson Cemetery1729 Prices Creek Road, Adair County, KY. The family requests visiting after 3pmCT, on Tuesday, September 22, 2015, at Stotts-Phelps-McQueary Funeral Home, 210 Greensburg Street, Columbia, KY.
Pallbearers: Bradley Dickson, Brian Fields, Travis Shirley, Mark Shirley, Raymond Dwayne Brown, and Randy Sexton. She was born in the Weed Community of Adair County, KY, on Thursday, October 24, 1925. She was the daughter of the late Andrew and Carrie Compton Moore. She died Sunday, September 20, 2015, at her home in the Prices Creek Community of Adair County, KY, at the age of 89 years, 10 months, and 27 days. Besides her parents she was preceded in death by one sister Cecil England and four brothers James, Sam, Amanuel and Herman Moore. Stotts-Phelps-McQueary Funeral Home, 210 Greensburg Street, Columbia, KY in charge of arrangements. 2015-09-21 - 210 Greensburg Street, Columbia, KY - Photo from Stotts-Phelps-McQueary Funeral Home.